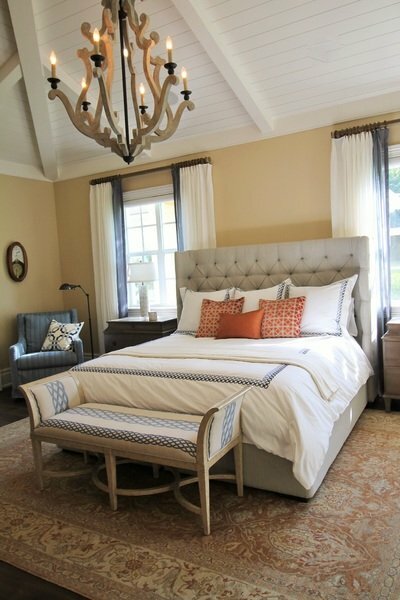 Sleeping in Style: How Do You Choose a Bedroom Color Scheme? Today’s bedroom isn’t just a place to crash after a long day. It’s not just a forgettable room down the hall either, or a glorified closet to breeze through as you get ready in the morning. It’s also definitely not an afterthought. More and more homeowners like you are relying on their bedrooms to offer a real oasis; a retreat from the busy outside world. Because of this, bedroom colors and design take on fresh purpose, making your selection process even more important. And, beyond just style, you may be surprised by how much of an impact color can have on you, your mood, and your energy. We’re not saying interior paint is the new coffee, but it’s pretty close. Should You Stick with Neutral Colors for Your Bedroom? Neutral paint, both on the warmer and cooler ends of the spectrum, are wildly popular. Cool greys and off-white offer clean, inviting style, and they play well with any other color schemes you want to introduce (furniture, comforters, pillows, blankets, artwork, etc.). In fact, Sherwin Williams is predicting their Poised Taupe to the be Color of the Year for 2017. It’s a neutral as well, but just a bit on the warmer side, offering an earthy, clay-like color. So, should you stick with neutral? You definitely can, but don’t go with it just yet. We’ve got a few more colorful ideas for you to keep in mind. TIP: Use Our Real-Time Remodeling Calculator and Find Out in Minutes How Much Your Bedroom Remodel Will Cost. One option is to simply find a color you love and run with it. That can work, but it also can lead to disappointment when you see the color actually in your space. Swatches are misleading, and magazines/websites often showcase colors that look fantastic in the pictures, but may be shown in spaces that have drastically different attributes than your room. What should you consider before choosing a color? Furniture and Decorations – A lot of folks forget to consider furniture, or what furniture they may have if an update is in order. Natural wood works well with a variety of wall colors, but more custom, painted furniture is also in vogue and needs to be factored in. Lighting – You may absolutely love that off-black accent wall you saw in a magazine in your dentist’s office, but will it work with your lighting? It can be disappointing to fall in love with a color, only to realize later that it simply doesn’t suit your room. Dark interior paint colors often require lots of light for balance, while lighter colors can brighten a room. Size – Much like lighting, the size of your room dictates (to a degree) which color will work best. Lighter colors tend to push walls out visually, while darker options close things in. Also, don’t forget to consider your ceiling color, especially if your goal is to make a space feel taller! Will Wallpaper Work in Your Bedroom? When you think wallpaper, try not to think of that terrifying wall of sunflowers and roosters in your great aunt’s house. Today’s wallpaper is a bit more subtle (well, it can be! ), often offering subdued variety in the form of attractive, well-behaved patterns and colors. One particular trend we see quite often is using wallpaper as an anchoring accent wall behind the bed. At the end of the day, your bedroom needs to do its job: create a haven that represents your taste, style, and personality. Whether this involves colors that are wild and vibrant or deep and peaceful, be sure to stay true to what you love. After all, when you love the room, it will naturally be a restful place to call home.